In a psychiatric hospital the nurses are thrown into an environment that requires of them, exactly as it does of the doctors, that their own inclinations should be set aside in the service of the patients. This demand is not always easy to fulfill, especially as life on the wards is of a nature to arouse the nurses’ own inner urges. It can, for example, be difficult for the nursing staff to understand why the doctors take such intensive care of a patient with regressive hysterical tendencies. They may well know that such conduct often hides childish helplessness; but their own worries and frustrations, with which they are unable to cope and for which they are, more or less unconsciously, demanding help, prevent them from completely accepting the doctors’ treatment of the patient. Occasionally the nurses’ own anxieties, ambivalences, and uncertainties can be an obstacle to adequate psychotherapeutic procedure (Boenheim 1963). It is, for instance, not easy for the nurses on a ward to alter, where necessary, their normal permissive attitude to one of refusal. And yet firm refusals are often necessary. It can happen, for example, that one single patient demands all the attention in a ward. Since this would hinder the development of the other patients, the nurse on duty must refuse to satisfy his exclusive demands. Or it can become necessary on occasion for the nurse to relieve a patient who is constantly forced into the position of underdog by sometimes taking on that role herself. So that the nursing staff can play their part without hindrance in the social and therapeutic life of the hospital, they need appropriate training as well as dedication and courage. The activities of the nursing staff take place in a “miniature society,” and each single patient has his place in the network of relationships that go to make a ward. Sociological knowledge are therefore useful. However, theoretical instruction is often too abstract. The best training is social self-analysis in a therapeutically orientated group. For this reason we began in 1957 to work with psychotherapeutic groups composed of classes from our nursing school. For our group sessions we take a class of ten to fifteen members on an average. We meet every week during their training periods; otherwise we see them when the nurses in question have to be withdrawn from their duties for purposes of instruction. As a rule one of our three sister tutors takes part in the group sessions. At the outset the therapist—who, for obvious reasons, should not be their class teacher—explains why they are summoned to a group session. They are told that the purpose of the group is not so much to discuss outside circumstances as to examine the problems that arise within themselves as a result of their work. In this circle they can bring forward whatever difficulties they have met in the course of their duties, particularly their own inward reaction to their work, the hospital atmosphere, their superiors, their workmates, or any other possible sources of conflict. When a class comes to one of these sessions for the first time, its members often have some difficulty in realizing the purpose of “group psychotherapy.” They think they are to receive instruction from yet another lecturer—as they often mistakenly suppose the therapist to be—and that they have to take it in more or less passively. But towards the end of the first hour, or perhaps not until the second, the participants gradually realize that they have to talk, without any other end in view, about any themes, concerns, or interests that may come out spontaneously. In discussion with the other group members, the sister tutor, and the therapist, they usually come up against their own inner conflicts. Tense situations that have occurred in the course of their duties, with one of the sister tutors or with staff nurses, come to light in the group, often as transference difficulties. An antagonism against her own mother or an older sister, for example, can make a trainee nurse inwardly very reluctant to accept an order from a nurse in authority. Or one of the young nurses may be bitterly disappointed if a staff nurse she identifies with her mother does not conduct herself as she expects of her. The situation of the nurses’ group reactivates earlier attitudes and feelings towards the whole family, parents and siblings, and it is essential for these nurses to succeed in recognizing the true nature of emotions that appear in the therapeutic group or in the course of hospital life and are often attributed to outside circumstances. Through taking part in the group sessions, the nurses are not left alone with their problems, and they gain support in this way. They are, moreover, taught to take a critical view of themselves and not always to look to other people first for the sources of tension. And at the same time they acquire a deeper understanding of the patients they are caring for. When we first began our group work with the trainees, certain of the qualified nurses were skeptical or even suspicious. This attitude may have stemmed partly from the fear of being talked about during the sessions. When it had been explained to them that the group sessions were not for the purpose of denigrating their colleagues or superiors but of helping individuals to recognize projections from their past, the group activity usually met with approval. We came to a particularly good understanding after 1959, when the medical superintendent of our hospital (Kielholz) began to form the various categories of qualified nurses into groups. We began by inviting the sisters or male charge nurses of the individual wards to sessions at regular intervals with the medical superintendent and the senior psychiatrists. The superintendent or other doctors have thus the opportunity to instruct those present and also to· confer with them. Naturally, emotions sometimes come out which had hitherto been held back, and all the participants are thus able to relieve their feelings. If they see that certain highly emotional assertions are met by the others with astonishment, they perhaps realize that the causes of their feelings are to be sought in themselves or in their past. If, on the contrary, they meet with friendly understanding, they will usually give up their unreal notions and be much more ready to carry out their hospital duties without prejudice. The medical superintendent and his doctors can also get to know in these group sessions which of their projects is approved and which rejected, so they can change their plans or learn how better to defend them. This procedure has proved useful in the planning of new wards; the medical superintendent meets the most varying groups of hospital staff so that the project can mature in an atmosphere of discussion and mutual advice. In 1959 we began withdrawing all qualified nurses by stages from their duties for two days in the year; during this time we gave them refresher courses and taught them more efficient working methods. We then introduced a few group meetings to give the nurses a chance to discuss subjects that interested them, including their own problems. Tensions that come to light often can be clarified in this way. It must be made clear to the participants that these group discussions do not necessarily show practical results in the daily activity of the hospital; their purpose is rather to dispel mutual suspicion, to make each other’s acquaintance, and to widen their horizons by seeing each other’s point of view. In some of the larger wards we arrange group sessions for the nursing staff every month. There too we discuss not so much professional questions as problems arising in the course of their work. It often becomes clear to all the participants that a nurse’s attitude towards a patient or a fellow worker is not based on objective facts but is a result of his or her own projections. The group discussions have a liberating effect on the whole of hospital life. Long pent-up or repressed emotions come to light, and their emergence frees the atmosphere of the hospital from an undercurrent of resentment. The participants also acquire a wider view of the motivation behind their treatment of the patients and thus are not as completely at the mercy of their unconscious conflicts as they were before. Whereas previously it was not always easy to interest the nursing staff in the patients’ psychotherapy, the nurses now feel much more responsible for the psychotherapeutic treatment of particular individuals. They will feel they have a Share of responsibility for the patients in their care and for the progress of the hospital to which they belong. 1. Group psychotherapy carried on in a psychiatric hospital allows us to treat the patients in a more intensive and comprehensive way than is possible with the exclusive use of individual psychotherapeutic methods. This is obvious in the fact that a large number of patients can be given at least a minimum or psychotherapeutic treatment. In confirmation of the experiences of other authors (Pinsky et al., 1964), we have observed that the introduction of group psychotherapy into a psychiatric hospital brings with it increased communication between the patients, and also between them and the doctors and nurses. They are drawn into an active social situation that encourages them to seek human relationships and to abandon the kind of behavior that makes contact impossible. When the patients are assembled for group therapy, some who have previously lived side by side in the ward without forming any relationship have entered into communication. Group psychotherapy, then, can change the vegetable existence of many hospitalized patients into a communicative group life. 2. It is true that in therapeutic groups static tendencies constantly appear; attitudes once taken up, or processes once completed, tend to become institutions. For example, a definite seating order in the group is often maintained. However, in a group led in a therapeutically meaningful way, there is a permanent dynamism which constantly works against this unfortunately strong attachment to stereotypes. In a hospital where group psychotherapy is active, the patients do not run the same risk of moving along rigid predetermined lines. This, in the case of schizophrenics, can help to prevent intellectual deterioration. As Lewin (1963) was able to prove by experiment, the influence of the group is quicker to bring about a change of behavior than any individual influence, even when it is the individual who is affected, as can happen for example at a lecture in the presence of a large number of people who are there at the same time but have no connection with him. 3. Group psychotherapy in the psychiatric clinic allows the patients to be observed in a “social” context and appropriately treated. The behavior of patients in a therapeutic group, as Racamier (1963) very rightly stresses, can give information on the psychodynamic phenomena behind it. For example, the strength or weakness of the ego in a patient can be judged by whether he can stand up to the interactions that take place within the group, or whether he is pushed out of it. The manner and the intensity with which a patient shares in the worries of his fellow group members, or isolates himself from them, can also show how capable he is of solving his own problems, or how far he is trapped in his own world even when important events are taking place outside. Participation in the emotions of the other group members and a distinct identification with them can, however, exist as a result of an identification transference (Slavson, 1955). If regression phenomena appear and one member of the group is visibly pleased to be fussed over and cared for by the rest, we can conclude that unfulfilled infantile wishes are being brought out by the group activity. Thus observation of the group dynamics can provide far-reaching information about the unconscious psychic motivation behind them. 4. What happens in the therapeutic group is the product of multiple collective experiences stemming from the composition of the group as it is at present, memories of the family group in early childhood, and the primeval consciousness of mankind in general. We notice over and over again that the processes that take place in the “therapeutic” group are very similar for all cultures. 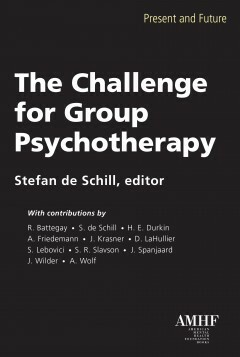 Although different therapists and different countries use different methods for group psychotherapy, the laws of group dynamics, as reported from countries no matter how far apart, are largely the same. It follows from this that the behavior of the individual in the group is not only typical of him but also characteristic of the species. If there are different therapeutic groups in one hospital they can be compared, leading to the conclusion that they all proceed in the same manner and in the same sequence: initial expectancy, accompanied by more or less obvious anxiety; catharsis with release of aggression; the appearance of multiple and multidimensional transferences, including resistances; elucidation of the transference or resistance; insight and transformation of the participants. The hospital offers an opportunity, through comparative study of psychotherapeutic groups, to become acquainted with laws of group dynamics that are common to all mankind. 5. As the emotions of the different members of the group call forth a response in the others, a “reinforcing effect” (Battegay, 1961) on the emotions occurs. The strengthening of the emotions can indeed lead to otherwise imperceptible feelings becoming manifest and thus capable of being worked upon. But occasionally, if the composition of the group is unfavorable, this very effect of reinforcement causes the emotions aroused to become dominant in all the members at once; this happens especially in large groups. Even previously well-structured groups are in danger of degenerating into an undisciplined mob, the various members of which either follow blindly or else behave in a completely inadequate and confused manner (Staehelin, 1947). On several occasions we have seen large therapeutic groups degenerate into a “mobs in miniature”; but this only happened when the therapist, through lack of experience, did not realize the possibility of such a development and did not exclude in time the attention-seeking and monopolizing, querulous, manic, or hyperthymic patients who were causing it. But if the group searches for the causes of the emotional conflict that was thus cathartically released, this exercises a mitigating effect on the emotions of the participants. This happens most frequently in groups of nurses or doctors. These therapeutically orientated groups have, therefore, a cleansing and relaxing influence on the whole hospital. 6. Knowledge of group dynamics makes it easier to judge the progress of therapeutic groups and also to understand the way groups are spontaneously formed in the hospital. Unfavorable grouping of patients in the wards can be altered when necessary, and in this way obstructive influences can be averted and therapeutic stimuli set up. 7. The cohesion that takes place in therapeutic groups, and the intensity of the group activity, act on the participants as a centripetal force, counteracting possible impulses to escape. Feelings of responsibility and duty towards the other members help the patients to make their own group discipline. Not least in importance is the fact that it is often easier for the patients to tolerate restrictions and denials imposed on them by their fellow patients than doctors’ orders. For that reason, too, running away is rarer in a group-centered hospital than in one which is not divided into these small collectives. The group structure of a psychiatric hospital takes the place of confining walls. Our hospital is in any case divided into separate blocks and thus into (large) groups, and a few years ago we took down all the enclosing walls and found that there were even fewer attempts to escape than before, since the attraction of climbing a forbidden wall was gone. The patients, the majority of whom came to us voluntarily, and who, as we have said, enjoy considerable freedom, take a much more intensive part in therapeutic activities than if they were compelled to do so. Therapeutically, they share the responsibility for themselves. But the staff too learns to realize that the demands of personal responsibility—and that does not mean excessive demands—are better for the patients than keeping them completely dependent behind walls. Since 1929, for example, all patients in our hospital who are not dangerous to themselves or others have been granted weekend leave, and only a few occasionally stay out. In general the patients are very glad to come back to their familiar hospital. Occasionally their affinity to the group and the group-centered hospital may be such that they are unwilling to leave it or, after discharge, soon want to come back into the protection of the group. We found a suitable solution: discharged patients who are thus attached to the hospital but do not attend any outpatients’ groups are invited once a week to a social evening on the wards. In this way they do not feel completely divorced from the group and have something to hold on to. If they carry on with the therapeutic group or remain in touch with hospital life—which is after all simply a large group—their prognosis also improves. The increasing group structure of the hospital has made it possible to speed up the opening of previously closed wards and of the hospital in general. This, as Harris et al. (1960) also observed, is improving the contact between the hospital and the outside world. Relatives are no longer afraid to visit; they are interested in the patients, and now we see streams of friends and relations coming into the hospital at visiting hours, whereas previously only a few near relatives found their way to the patients. 8. Group psychotherapy is not usually the only method of treatment used in the psychiatric hospital. But it complements psychiatric and pharmacological methods in the social field and. gives the patients the chance to collect experiences of reality. If a whole ward is organized as a large therapeutic group, the collective therapy becomes a unifying bond between all the patients. The additional group treatment keeps a balance between individuals, and the patients can then be variously handled according to their separate needs, without the risk of conflicts and rivalries. 9. If the doctors know, from personal experience, the natural course of events in a therapeutic group, they will have a deeper understanding of the dynamic processes that develop spontaneously in a hospital ward. They will also be better able to grasp what happens in the actual therapeutic groups. If at the same time group psychotherapeutic work is done with the nursing staff, they too will become an active part of the whole. A team will be created capable of sharing the psychiatric treatment with the doctors. Group work with doctors and nurses has still more to contribute; it brings to the hospital a therapeutically active atmosphere.